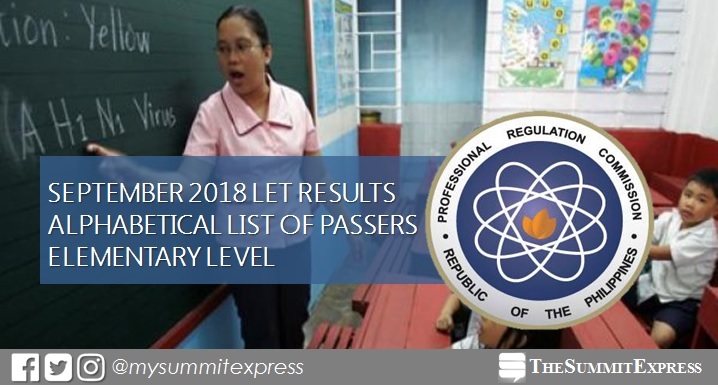 MANILA, Philippines – (Updated December 7) The Professional Regulation Commission (PRC) released the alphabetical list of passers of September 2018 Teachers board exam or licensure exam for teachers (LET) - Elementary level on Friday, December 7 2018. UPDATE: A total of 18,409 elementary teachers out of 90,750 examinees (20.29%) passed the exams. It is further announced that of the 18,409 elementary teacher passers, 17,200 are first timers and 1,209 are repeaters. On this page, the complete list of passers or those who have successfully hurdled the tests will be posted. List below will be activated once LET results are announced online. The September 2018 LET passers are those who obtained an average rating of not less than 75% and have no rating lower than 50% in any of the subjects. PRC administered the LET board exam on September 30, 2018 in at least 25 testing centers in the country. PRC Resolution No. 2017-1068 stated that the target release of September 2018 LET results is on Tuesday, December 4 or in 44 working days after the test.Note that results may be released ahead or beyond the target without prior notice. In the same period last year, results were released in 43 working days after the exam. A total of 21,198 elementary teachers out of 80,509 (26.33%) successfully hurdled the exams. Meanwhile, results of September 2016 were announced after 48 working days. PRC named 23,378 out of 77,466 (30.18%) elementary teachers who passed the tests. Reliable source and the 'ultimate reviewer' of CBRC Dr. Carl Balita on November 1 shared that results will be released this month. "NOVEMBER is the MONTH that the Lord has made. LET us rejoice.... who will be LPTs soon?, Balita said"
December 2, 2018 Update: LET results are out this week (December 3-7).